We know that data sets have been compiled on students, but in Missouri, we are told by our state agency that it is "not its intent" to compile personal information data on students. While it might not be DESE's stated intent to gather personal student data, it may inconsequential if mandates exist requiring state educational agencies or local school districts to track students and provide certain data. 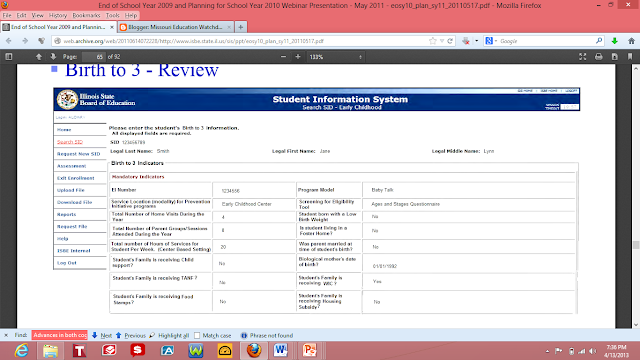 Illinois will be gathering data on children from 24 hours old to 3 years old in its Student Information System (SIS). It is not stated whether this is mandated by a federal requirement, but this information taken by the state on children less than 3 years old includes data beyond the usual information of name, address, courses taken and attendance. The Illinois State Board of Education, along with our Education Partners, is now actively moving forward with the design and development of the state-wide Illinois Longitudinal Data System (ILDS). The system, when fully deployed, will provide data to help to track the outcomes of Illinois students as they progress from Pre-K through Postsecondary education, and as they enter the workforce. Longitudinal data supports an in-depth, comprehensive view of students’ progress and will ultimately help guide policymakers on where to invest time and energy to most effectively improve student achievement in our State. The ILDS is defined by Public Act 96-0107 and enabled through federal funding, and instructs the State Board of Education to link student test scores, length of enrollment and graduation records over time. The system also will connect students to career planning and resources, with the potential to facilitate the application process for financial aid and records transfer for students. These data also can be linked to external data sets on employment, labor needs across sectors, economic development, community assets, and so forth. Why is it necessary for the government to track a mother's marital status, federal/state assistance received, low birth weight of the baby, etc? If a baby is born with health problems into a one-parent home that depends on governmental assistance, does it put the child on a certain track? Why do you think tracking begins at 24 hours old instead of a newborn? Finite resources must be used appropriately on the human capital most likely to reap the advantages of those resources and this particular child is not starting off as a good investment based on its data. Note that the baby is not the only person tracked. Parent(s) are also tracked as to their behavior.